Among new medical technologies, urodynamic equipment options have also been part of the new generation of updated technology. These urodynamic systems are easier to use, display accurate information, and are compact and portable. New features make it much easier to transport the machine from job to job and all information that is collected is displayed and easy to interpret. Urodynamic systems are created to investigate the function of the urinary tract by taking physical measurements with bladder pressure and flows of rates.In addition to purchasing equipment, we offer a turn-key solution, and you don’t need to pay upfront for the system or pay to have it maintained. Our solution includes the urodymics equipment along with the staff, supplies, and software. If you are interested in more information on our turn-key urodynamics testing services, click the button belowto get more info. The rediCADDY is a new urodynamic system which is designed to be compact and easy to transport when you’re on the go. It’s designed with a unique intuitive turnkey system and is built to be used in multiple settings. The whole system is designed with wireless technology which allows you to send data to your laptop or computer. The system features user-friendly software that doesn’t require training to interpret. It includes a device that measures and detects pressure variances in any patient’s bladder. The device can be used on patients, and all collected data will be transmitted to your computer. Redi Flow is a flow meter which tracks the flow rate and volume of liquid from a patient’s bladder. Redi Fill, which will be used during the cystometrogram study the patient's bladder, will be filled with a saline solution. Technology Bundle, which is included, is a software package which helps schedule your patients, can help you design and perform exams and can even print out the results of your patient's exams. Portable Stand, a stand which can be used to hold your laptop while you’re using the equipment. Redi Cath is a kit designed to be used with the RediPORT and includes all sensors and tubing. 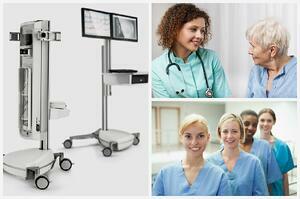 The Laborie Aquarius urodynamic systems come in a variety of different designs. The Aquarius CT is the most advanced of their systems. It features integrated pelvic floor diagnostics which are advanced in technology. They are designed with a workstation that is installed with state of the art software for easy use and customization. Powerful UDS Software is installed with LABORIE systems whose advanced software which can help you get accurate results with its analysis system. It has all protocols for ICS testing, Remote Intuitive Control with a wireless touchscreen which you can use with remote control, and it helps give you precise urodynamics and results in shorter testing times for your patients. A High Specification Industrial Hard Drive will be able to perform tasks at faster speeds. All data that is collected will be automatically backed up onto your laptop. Choose 1 or 2 touchscreen monitors. Upgrade Options uses Anorectal Manometry which has a 360 ultrasound probe. There are multi-monitor displays which allow you to view the bladder and look at the X-ray images. The EasyPro4 is a new generation of urodynamic systems. It’s designed to be easy to use for clinical use, and the data that is recorded is easy to interpret. It has an LPD-3d leak point detector which can detect the first amount of urine. The system can also detect repeated leaks and will continue to record these events. It uses an electronic sensor to record these leaks, and it will then log this data into the system. This system is one of the leading multichannel urodynamic systems that can help diagnose a patient's urinary incontinence. It uses state of the art urodynamic software and is designed to be used by OB-GYN offices. It’s intuitive software can help you record accurate results for your patients. It has a touchscreen interface which can help you get fast and quick results. Use it with the fiberoptic catheter to ensure that all of the data and results that are provided to you are accurate. The Morpheus Complex Urodynamic system is designed with a digital control infusion pump with silencing technology. It has high sensitivity uroflowmetry which can help measure minimum and maximum flow rates. There is an intuitive and seamless study phase transition with each patient. Other features that are included in this system; document transfers, reports, cough and Valsalva leak point pressures, void detection, and urethral pressure profiles. There are many urodynamic systems on the market, and many of them are upgraded to give you the best features. They are designed to be portable, easy to use, and provide you with access to data in only a matter of a few minutes. If you’re interested in providing Urodynamic testing for your patients, we offer a turn-key solution, and you don’t need to pay upfront for the system or pay to have it maintained.